I think most Moms out there, like me, can appreciate it when our kids can do things by themselves! As much as I miss those days of wiping my kids' bottoms, spoon-feeding those jars of spinach & kale baby food, and changing their dirty onesies seven times a day (hahaha!!! 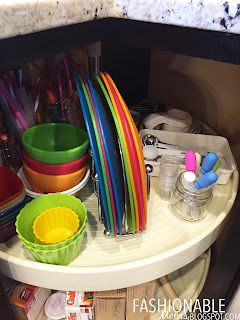 ), I have really tried to teach and encourage my kids to do things for themselves. 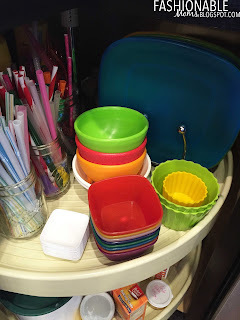 One thing I have seen other kids do in many of my friends' homes is ask Mom for a drink of water. 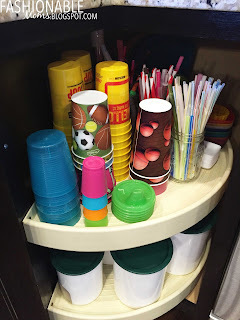 The Mom goes into the cabinet and gets a cup and fills it up for the child. Three minutes later, kid #2 is asking the same thing....then the two neighbor girls....you get where I'm going with this? 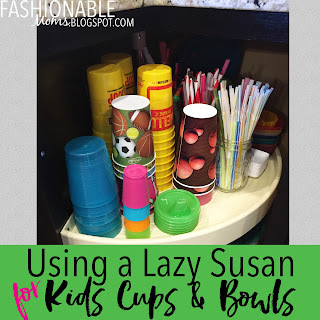 So I wanted to share something that we've done for years: use our Lazy Susan for all the kids cups, straws, bowls and plates. You don't necessarily need a Lazy Susan for this system. 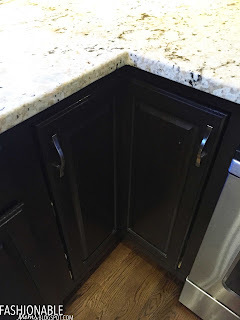 Any cabinet, pantry, drawer, etc. that is low enough and accessible to the kids would work great!!! It's nothing fancy. Most of the cups are the freebies from Dickey's BBQ! When the kids want a bowl of pretzels, they can just go in and get a bowl themselves.